This morning I convened a virtualization workshop, one of the sessions to kick off the OSG All Hands meeting in Baton Rouge, Louisiana. We had a very good attendance, much more than I expected. Representatives from various VOs (CMS, ATLAS, Engage), OSG site and technology providers (e.g Nimbus, IPOP). 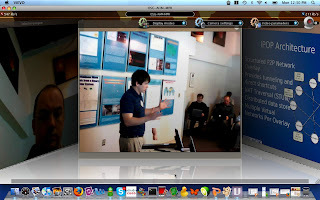 I attach a snapshot of EVO during David Woliknsky's talk on virtual network. The full agenda with the slides is available in Indico, we had several talks on the Globus Nimbus cloud system, with several use cases from STAR/ATLAS and from Purdue. Keith Chadwick from FermiGrid talked about high availability services using Xen to consolidate servers among various Fermigrid stakeholders. I presented our work at Clemson on scheduling overlay using KVM, and David presented IPOP as an enabling virtual network technology. More tomorrow, I will try to find some users for Clemson grid, try to get some info about NAT setup on large clusters, hunt down John McGee and get a few beers at night.